This is my favourite filling for spring rolls. I advise cooking the duck the day before as it needs a couple of hours in the oven. 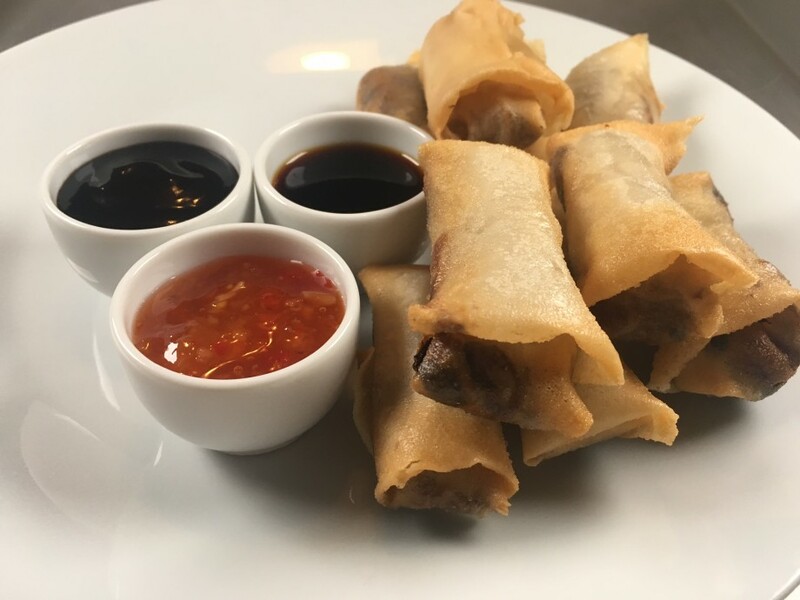 If you can’t find spring roll wrappers you could use filo pastry and bake the rolls. The duck and shitake filling is also delicious added to stir-fried vegetables. I only had small spring roll wrappers so made cocktail-sized ones but you could get at least 12-15 large-sized spring rolls from this amount of filling. Heat the oven to 170˚c, fan oven 150˚c, mark 3. 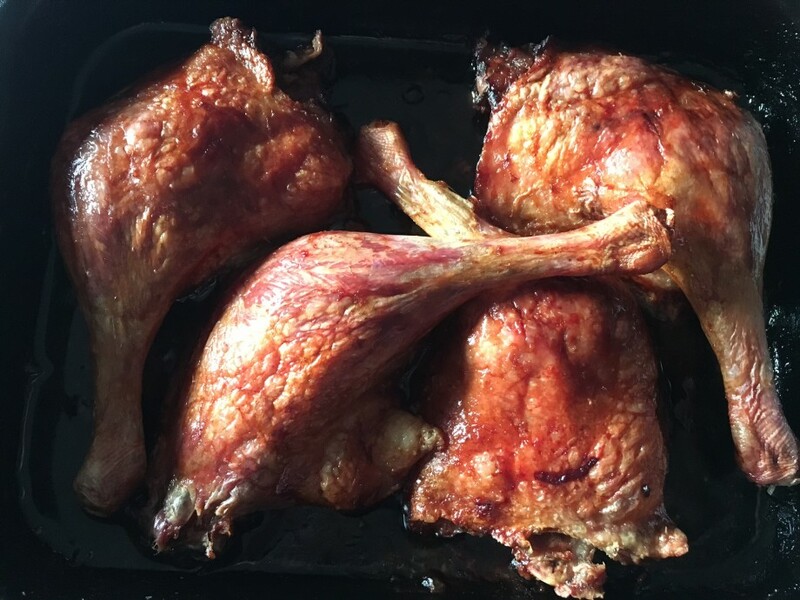 Put the duck legs in a roasting tin and pour over the soy sauce and Shaoxing rice wine. Roast for about 2-2 ¼ hours until the duck is very tender with a crispy skin. Cool a little then pick the meat off the bones and finely shred. Set aside. 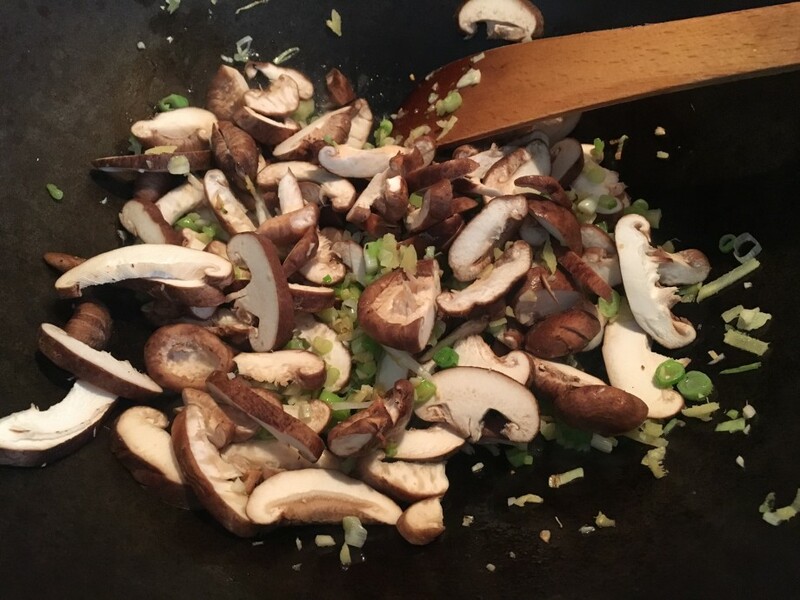 Heat the ½ tablespoon oil in a wok and stir-fry the spring onions, ginger and garlic for 2 minutes. Add the shitake mushrooms and stir-fry for 2 minutes. Add the beansprouts, soy, fish sauce and sesame oil and stir-fry for 2 minutes. 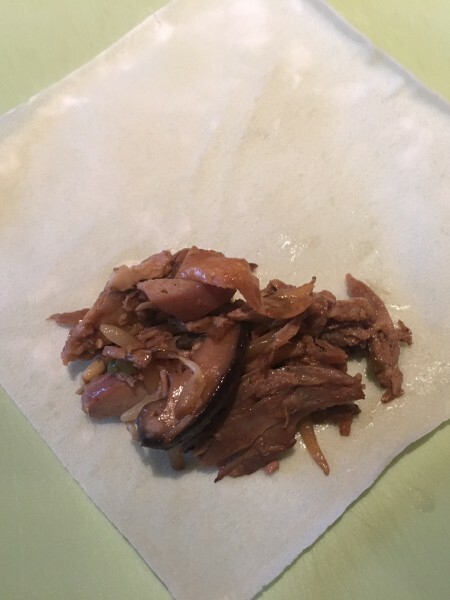 Leave to cool and stir in the shredded duck. Taste and season with salt and pepper. Mix the cornflour with 2 tablespoons cold water. This is going to be used to seal the wrappers. 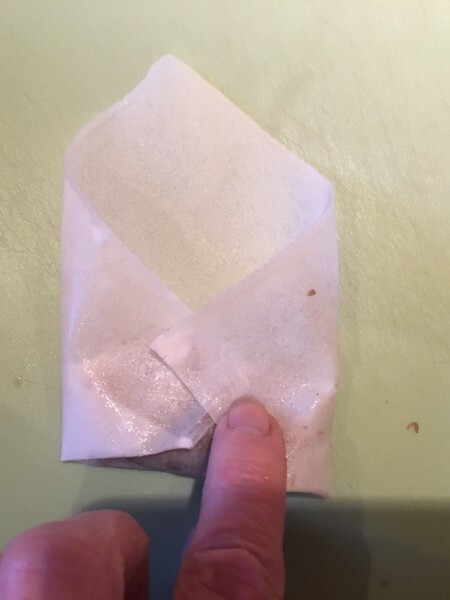 Place a spring roll wrapper with a point towards you-like a diamond. Put a teaspoon (if you are using the small wrappers) of filling near the pointed end. Roll this end up towards the middle then fold over each side, using a little of the cornflour to seal the edges. Continue to roll, sealing the top with a little of the cornflour/water mixture. Repeat until you have used up the filling. Heat some oil in a wok, about 2-3 cm (or fill a deep-fryer) to 170˚c. Fry the spring rolls 3 or 4 at a time for about 3 minutes until golden brown and crispy. Drain on kitchen paper and keep warm in a low oven while you fry the remaining spring rolls. Serve as soon as possible with hoisin, sweet chilli or soy sauce for dipping.